For a limited time, receive free shipping when you order a jar of Buckler's. 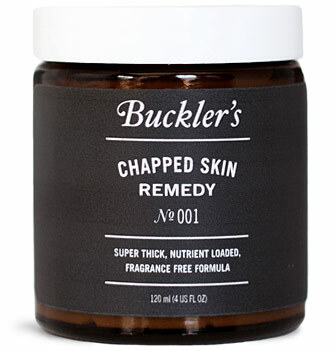 Buckler's Chapped Skin Remedy ($16) is a heavy-duty, all weather cream that provides deep hydration—repairing chapped, irritated skin and guarding it from the effects of the elements. In development by the team behind The Motley for more than a year, it's a nutrient-loaded skin shield. They're not kidding when they say this stuff is heavy-duty. The cream is thick. Scoop out a finger tip's worth and smooth it into hands and wherever else it's needed. They recommend it for "hands, feet, elbows, and all areas prone to extreme dryness." We applied the stuff two ways—first, on dry, chapped hands and then as a more routine, preventative measure. On a dry pair of paws (scratchy patches of skin, a few light cracks and some redness), the application of the Buckler's brought instant relief. Perhaps it's the aloe, shea butter or chamomile, but it took that nagging sting out immediately. We liked the fact that it's fragrance free. But it does take some time to absorb into dry skin and can feel a bit slippery. But this isn't your everyday body lotion. So we used it after a shower, before going to bed. Slathered it onto hands and feet and woke up with noticeably softer skin—no cracks, no redness. After doing this a few times each week, we've had no complaints whatsoever and haven't needed to reapply during the day.